I'm dreaming. I must be, or perhaps I've died and gone to shark heaven. I'm hanging in the blue water under Jim and Anna Abernethy's live aboard the MV Shearwater. 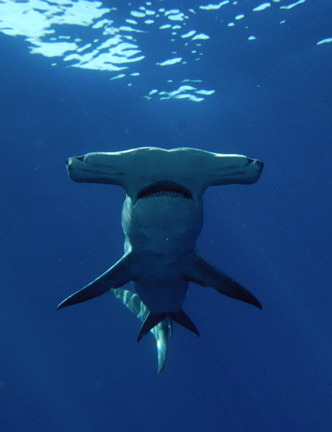 Two Great Hammerhead sharks are circling me and a handful of other lucky divers. One of the hammers is timid, perhaps 10 feet or so and lost at the edge of visibility. A ghost shark. It cruises in for the occasional close pass, teasing us with its slow undulating head-swings as it effortlessly slips through the water. 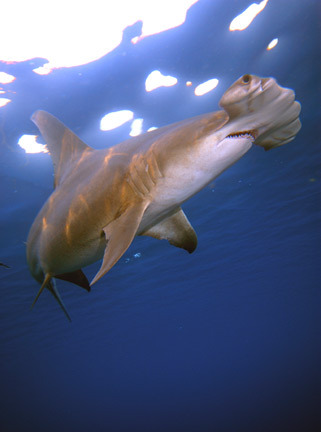 The second hammer, a female and the larger and bolder of the two approaches fearlessly and cutting through the ever present reef sharks nonchalantly winds its way in towards the bait suspended at the surface. Opening its jaws wider than appears possible it clamps down hard, thrashes twice and swings away gulping down its prize to the delight of the surrounding divers. Four sets of strobes flash like under water fire crackers. She cruises away but soon turns and comes back at us for another run. Lungs burning I stifle the urge to breath as she closes in closer and closer. She comes straight at me serenely, non threatening, and just before she carves away I squeeze the shutter and am rewarded with a head on image of long spiky fins radiating from a muscular central core. This view of her reminds me of an undersea mine and has the same explosive power. She passes overhead and lunges at the bait once again. She is a player; a photographers dream shark. Repeatedly she circles us perhaps curious but never with malice and striving for that quintessential Hammerhead shot I position myself just down current from the bait and tread water in the chum slick wary of reef sharks which constantly harass me. 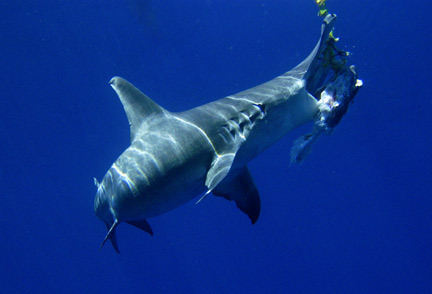 The Reef sharks which are up to around seven feet long look like toys as the Hammer drifts back in for another serving. One bad tempered reef shark repeatedly nips at my strobes and fins. I'm hit from behind and pushed deeper. Jim later tells me that it was the same shark that had circled behind me and taken a bite at my first stage. I drift away in the current with the hammer and look back to see the boat fading into the fog. Time to grab a final glimpse and start the long kick back to the Shearwater. 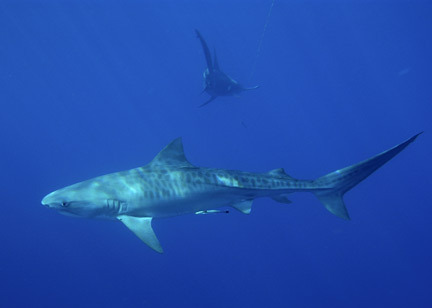 I turn and there in front of me is a vividly striped tiger shark cruising across my field of vision. Beyond it the Hammer's long caudal fin snakes away into the mist. I hover breathless composing my shot and snap two frames before this timid shark with its ferocious reputation slips away back to its hidden life. Heaven. After 4 dives and 6 hours in the cool winter seas of the outer Bahamas I struggle back onto the boat spent and utterly sated. That night, our last of seven shark swept days we swim in bottomless water with hunting spotted dolphins, clumsily mimicking their antics. I float alone in the dark and my mind drifts back to the days earlier encounters. At no time during the whole experience did I feel even mildly threatened by these powerful but docile giants. Looking down now into the blackness I feel a shiver of doubt and climb back onboard and lay back satisfied to watch the stars as the shearwater pulls anchor and heads for home.